USA’s Paul Schaus is one of four Purple Heart winners on his team’s roster this year. The coach for the United States team at the IPC Sledge Hockey World Championships doesn’t have to worry much about leadership or discipline in his locker room. Four members of the U.S. team are retired Marines who are recipients of the Purple Heart. Team USA meets Norway at 8 p.m. Friday at HarborCenter in a semifinal match. The winner faces either Canada or Russia in Sunday’s title game. It’s hard to imagine that a more heroic group of athletes ever has represented the country in any sporting competition in Western New York. The four Marines all were injured in combat situations. 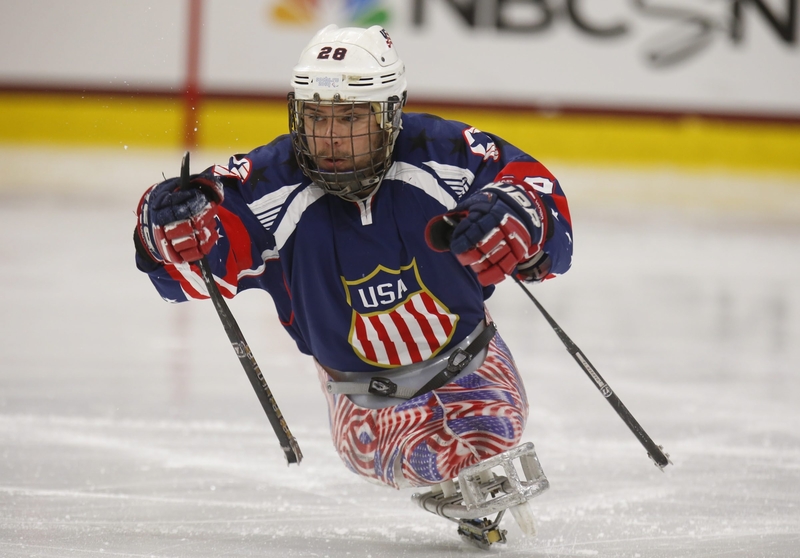 Buffalo native Paul Schaus, in his fourth year on the U.S. squad, lost both of his legs after being injured by an improvised explosive device in Afghanistan in June 2009. Teammates Josh Sweeney, Luke McDermott and Josh Misiewicz likewise all needed bilateral amputations after being injured by IEDs while serving in Afghanistan. What is it like to coach four Purple Heart recipients? Sauer, who won 655 games in a 31-year college coaching career, takes a long breath before answering. Schaus, 26, played a lot of hockey growing up. He was in the Bud Bakewell club program in Buffalo for many years. He graduated from Kenmore West High School in 2006, but he played for the Riverside High hockey team. Getting back on the ice again means a lot. Schaus was a lance corporal in the Marines. He served an eight-month tour of duty in Iraq in 2008 before being deployed with the 2nd Battalion, 3rd Marine Regiment, to Afghanistan’s Hemland Province, a Taliban stronghold, the following year. That’s where he was injured, during a firefight with insurgents. He also lost his left ring finger. Schaus doesn’t seek out many interviews because he likes to keep the focus on his teammates. But hockey has helped him move forward in his life. Embracing the team-oriented environment comes naturally to each of the four Marines on the U.S. squad. Schaus has two goals and an assist through three preliminary-round games. Lancaster’s Adam Page has three goals and four assists. The U.S. team (3-0) has outscored its foes, 20-1. Norway (2-1) holds an 8-6 scoring edge. The Canada-Russia game is at 4:30 p.m. Tickets are available at the First Niagara Center box office. On Thursday, Germany advanced to the fifth-place game on Saturday by scoring a 1-0 victory over the Czech Republic. Simon Kunst made 12 saves and earned the shutout as Germany got its first win. Felix Schrader scored in the second period. Germany will face Italy, which defeated Japan by a score of 5-1 in Thursday night’s other consolation-round game, in that matchup.